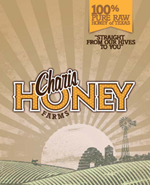 Mission: To produce a variety of excellent honeys from multiple locations in north central Texas, and use it as a tangible example of grace to point people toward the infinitely greater grace of God’s forgiveness. Why the name Charis (kar-is)? It is the Greek word for grace (that which affords pleasure, joy, or delight). Does that not describe honey? Grace also means getting what you don’t deserve; it’s not a prize for what you achieve, or a reward for anything you do. It is receiving the good you don’t deserve at the expense of someone else. Man can do many amazing things, but two things he cannot do is make honey, or save himself from sin’s penalty. We get honey because God made honey bees able to make more than they need. Even though it takes the nectar of 1 million flowers to make one teaspoon of honey, they still make far more than they use. Both honey and forgiveness are made possible through works of grace. We benefit from the truly awesome works of someone else. As you enjoy this sweet example of grace we call honey, may you reflect on the greater grace of God’s love for us and His forgiveness. He became our sin so we could become His righteous children (1 Corinthians 5:21). That is truly amazing charis.